Egg Donor IVF therapy is extraordinarily successful. Using donor eggs can elevate a patient’s likelihood of achieving a successful pregnancy up to 70% in just one cycle, even if previous IVF cycles using the patient’s own eggs have failed. Furthermore, with donor egg IVF treatment, the age of the woman is virtually irrelevant regarding ivf success. IVF donor eggs reverse the biological clock if you are considering IVF over 40 or IVF over 45 (IVF at 50) or even IVF over 50, as long as you are under 51 years of age. Overcoming many of the fertility problems caused by age. Using donor eggs also is extremely successful for women who have suffered premature ovarian failure, recurrent miscarriage and other problems. Thanks to donor egg IVF treatment, women who have been unable to conceive using their own eggs can IVF success and experience the joys of pregnancy and motherhood. 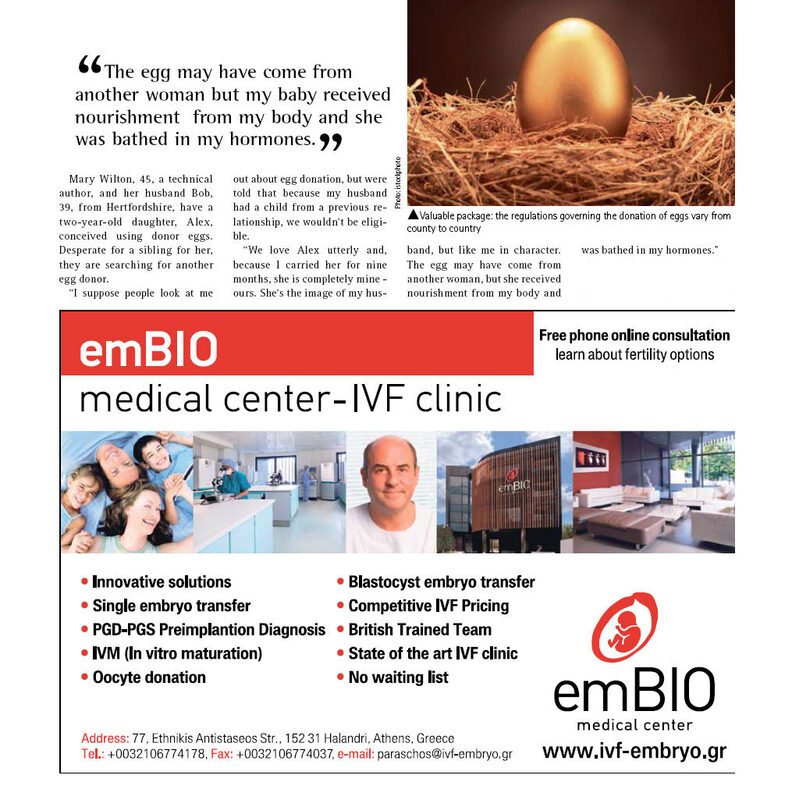 In an average sole match donor egg IVF cycle (one donor matched to one recipient) at EmBIO, 80% of couples produce enough embryos for cryopreservation (freezing), thus allowing for additional low-cost embryo transfer cycles without the need for a second full donor egg IVF cycle if the fresh transfer does not achieve an immediate pregnancy. Having a high quality frozen embryo program is critical to offering higher, cumulative probabilities of success. Our data on fresh and frozen embryo cycles in donor egg IVF is very encouraging for couples anxiously seeking to have a child. From the initial fresh transfer alone, over 50% of couples establish a pregnancy, an additional 30% of the remainder will conceive from the first frozen embryo transfer, and with repetitive efforts only a tiny fraction of patients will not succeed in getting the baby they desire. The ability to offer a high-quality frozen embryo program distinguishes a program's success rate overall. Our institute has one of the most comprehensive and successful storage programs available, storing embryos for couples from all of our IVF treatment programs for over 15 years. It is important to note that at our institute we freeze every embryo in an individual container rather than combining multiple embryos. This allows each couple the ability to decide exactly how many embryo(s) they want to thaw and transfer. Couples come to appreciate that, if they are making a significant investment in time, effort and finances, they want to maximize their chance of success from just one egg donor cycle. We cannot guarantee that all our donors will produce enough embryos for two or more transfer cycles. Yet, in a sole match cycle the likelihood is very high that a couple will have enough embryos for at least one more additional transfer cycle of frozen embryos from just one Donor Egg IVF cycle. At EmBIO IVF Center a single frozen embryo transfer produces pregnancy in an additional 33% of patients who did not get pregnant from their first fresh embryo transfer. In summary, we offer one of the world's leading Egg Donation Programmes, a fabulous array of top quality donors who are fully screened and immediately available, including many doctoral donors, and a full range of financial options to help you pay for your Donor Egg IVF treatment. We look forward to providing you with the highest level of donor egg IVF treatment. Read Donor Egg Success Stories! Ask for an initial free consultation!